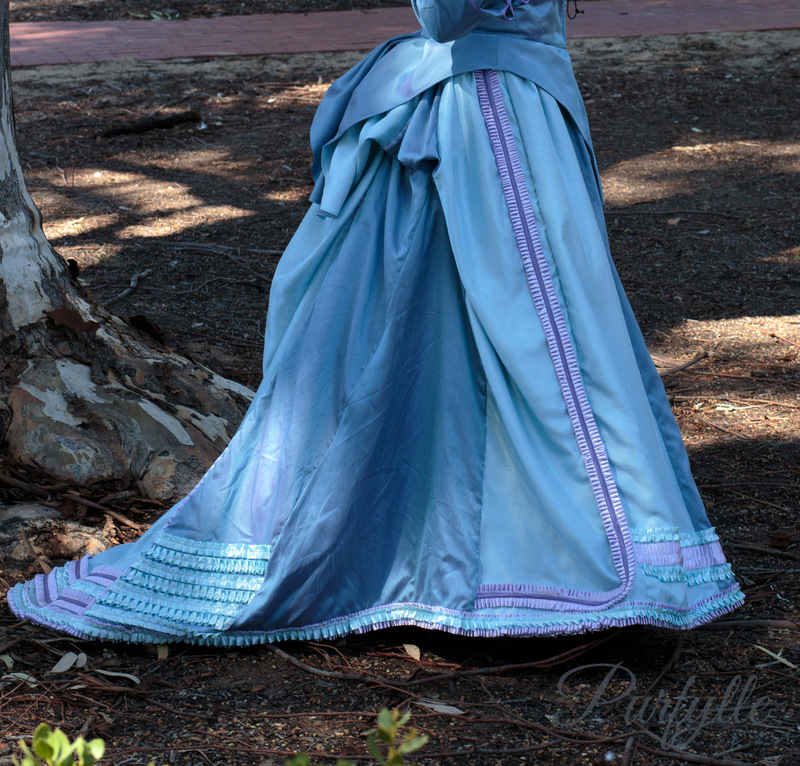 The gown I wore to the Heritage Festival needs a name, My Big Froufy Costumey Costume is perfect for it don't you think? 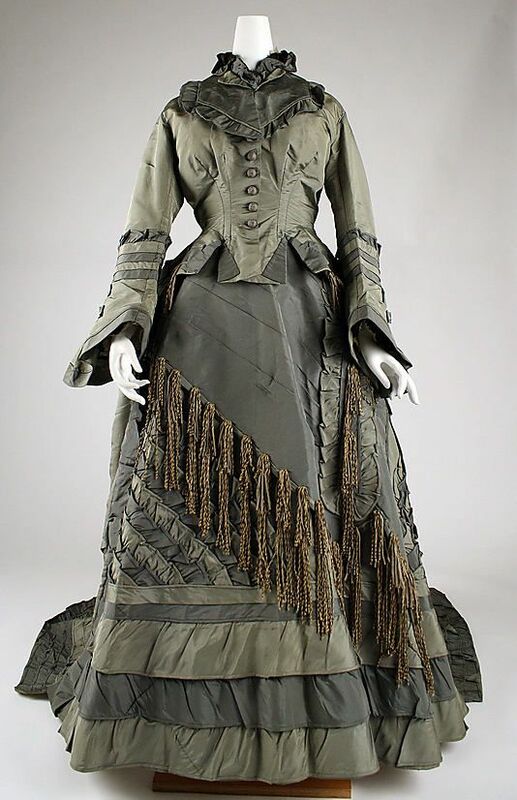 The below images of extant gowns have been sourced from Pinterest and can be found on my Pinterest board 1868-1876 Early Bustle era. 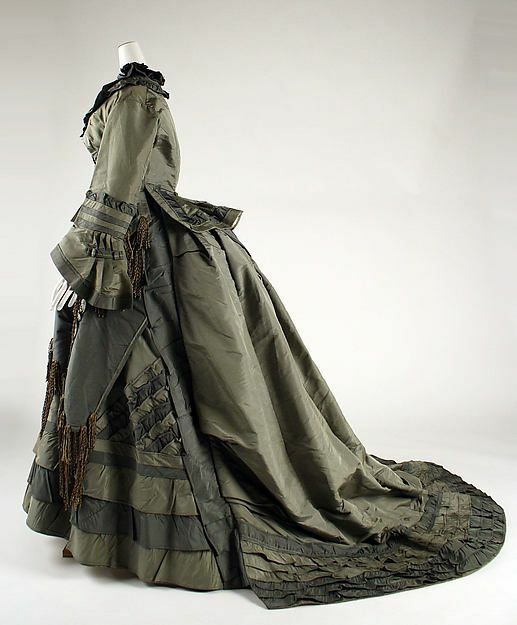 This multi hued visiting dress was the primary inspiration for my skirt decoration choices. 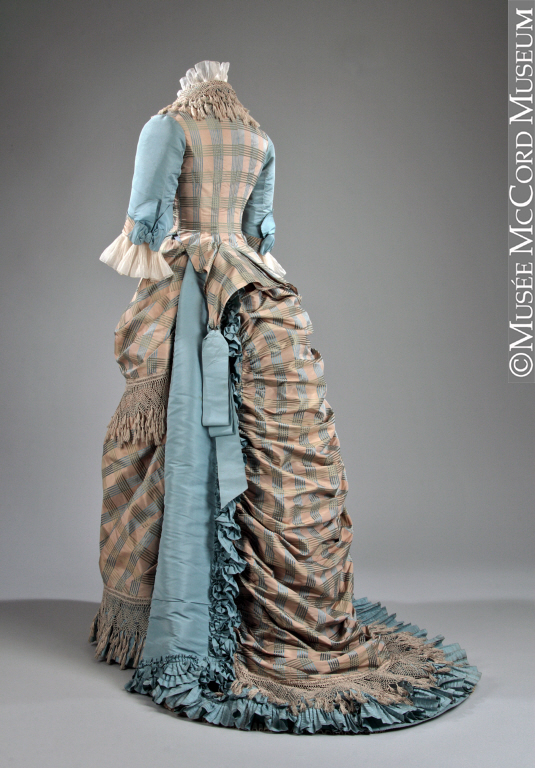 I tried adding a similar ruffle at the front side, as well as the ruffles at the base of the train. The multiple shades convinced me that it was okay to use the two shades of fabric I had. Not that I had a lot of choice in how I used the fabric as it was being re-purposed from offcuts and two old projects that had never been completed. Search as I might I could not find another view of this blue gown from the other side or the front. 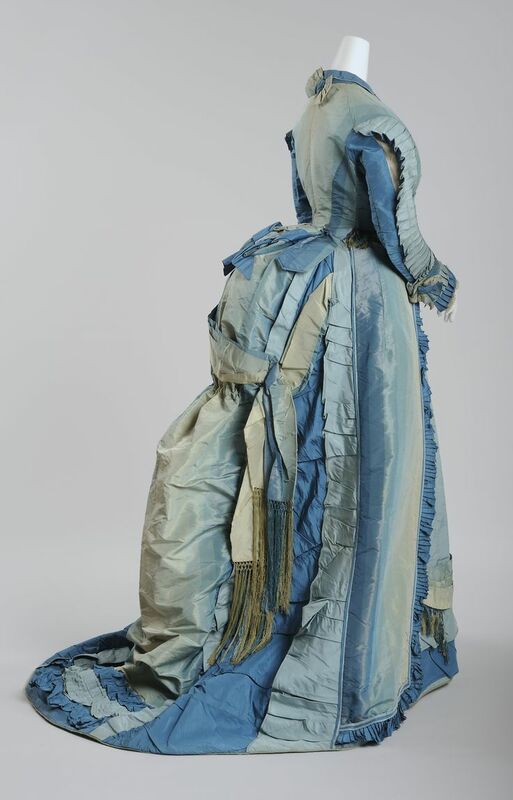 The beautiful asymmetrical ruffles on this American gown inspired me to try a similar effect on the right rear side panel. As I stitched the blue ruffles to the side back panel prior to attaching the panel to the train I didn't quite get the angles as sharp as I wanted. In fact when the hem was trimmed to shape they looked like hem decoration rather then higher up the panel as I had originally envisioned. I guess these things happen when you only vaguely mark the skirt pattern out on the fabric and worry about the hem line later. Hubby, my photographer, was amazing! He even gave up watching the world cup to come to the fair with me and take photos, now that's true love. However, his strong point isn't remembering to get the train into the shot or to tell me my skirt is askew or that the hem is wonky and the skirt bustle needs to be let down. That's why you need a costuming buddy, but my buddy is some 4000 klms away hence the wonkyness here and there. Unfortunately those ruffles and hem details seem to have escaped nearly every photo from the fair. I have lost the reference gown for the zig zag decoration on the other side. I think it was a Met Museum gown. It is going to drive me crazy until I find it now. 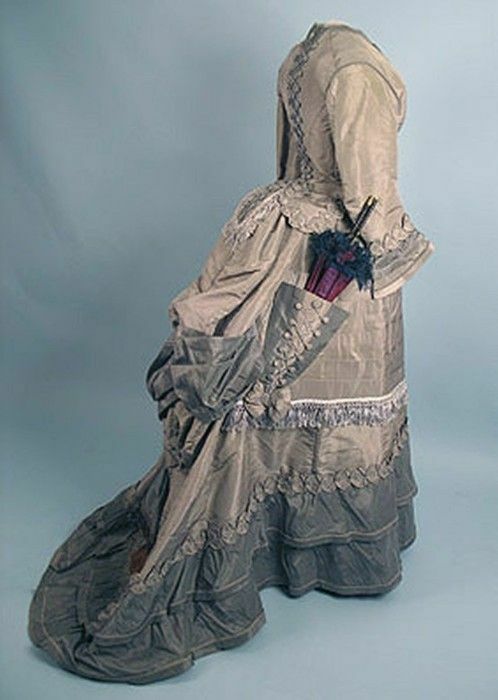 Above is another gown with contrasting panels in the skirt, a rarer feature in contemporary garments then the base fabric of the gown being one colour and the trims another, as can be seen in the 1870's walking suit below. 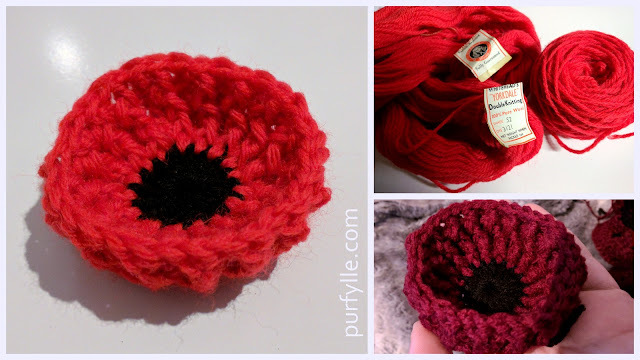 I had plans of adding a parasol pocket, but time did not permit. 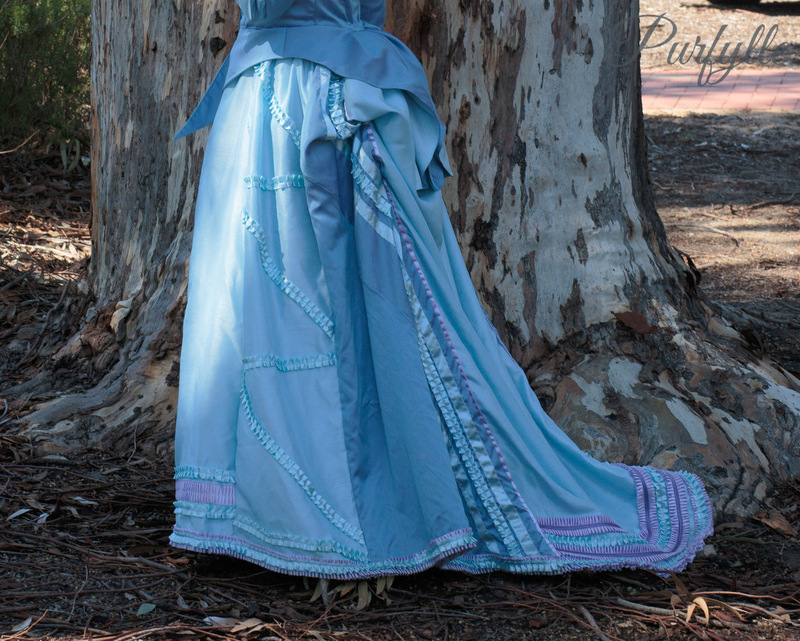 I ended up having to use bits of fabric I thought I would get to use for the overskirt so now I'm not sure if I will have enough fabric for either an overskirt or a parasol pocket. Just Beautiful. I Love costumes. They are so fun and this one is Fabulous. Thank you for sharing. 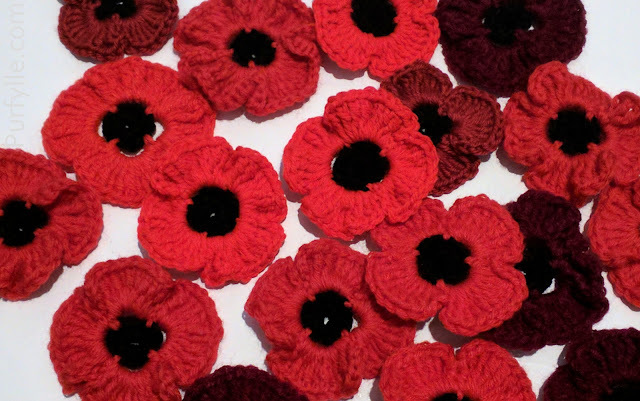 Thanks Becky, I hope to remake it with some lovely fabrics and a proper fit. Thanks for visiting.